As we approach what is arguably the most important Chelsea v Spurs game ever, because it could decide the destiny of the race between these two clubs for a top four place, I sincerely hope that this is the very last time I shall publish what I have christened "The Hoodoo File". Just have a look at this list of 39 teams which have won a game against Chelsea at Stamford Bridge, since David Howells and Gary Lineker scored the two goals that gave us a 2-1 win in February 1990. Spurs are the only ever-present Premier League team (there are just six of us now) never to have won a game there, and of this season's elite flight, only Watford, West Brom, Swansea, and Brighton have not won at Stamford Bridge in the last 28 years. This is a list of shame, truth be told. Look closely and note that even current League One sides Oldham, Bradford, Oxford Utd and Blackpool have won there! Bournemouth have only played three Premier League games and one League Cup game in recent years at Stamford Bridge, but even they have won at the Bridge twice! Tottenham Hotspur's 25 matches at Stamford Bridge without winning in the Premier League is the most that one team has played on one ground without a single victory in the competition. Chelsea are looking for their first league "double" over Spurs since the 2005/06 season. The mathematics of the situation this weekend are simple. If we can finally break this crippling hoodoo then we would go eight points clear of Chelsea with just seven Premier League games remaining. A draw would be a good result, maintaining the gap of five points and even defeat would not end our prospects. For the first time in my recent memories this is surely a must win for Antonio Conte's side. Under Conte, Chelsea's recent run of bad form goes back as far as their last 18 games in all competitions which include just 6 wins. Over the same number of games, Pochettino's Spurs have won 11 and lost just one of their games. We have won five of our last six league games. Chelsea lost 3-0 at home to Bournemouth. Spurs beat the same team 4-1 away in their last league game. We are the form side, but will we be the bookies' favourites? I doubt it. Why not check out football bets today to see just who are the favourites to win this game? Chelsea hate us. As a club they and their fans hate us with a passion which easily matches that of the most ferocious derby match you could name in the UK. The atmosphere will be hot, and while we don't want another "Battle of Stamford Bridge", things could get fiery. What has led to this recent decline of Chelsea under Conte? Well no doubt his falling out with Diego Costa has cost the club the type of aggression and goal-scoring power they enjoyed with Costa and with Drogba before him. Eden Hazard carries a lot of responsibility and just leads the Premier League scoring chart from Morata (11 to 10) and Morata's goal against Leicester in the FA Cup quarter-final was his first since Boxing Day. In recent matches Willian has led Chelsea's scoring with five goals, and he could be a major danger for Spurs on Sunday. Add to this the loss of form of the ageing Gary Cahill, plus injury (and another managerial bust-up) with David Luiz and you get an idea of the problems which beset a club whose only hope of a trophy this season is the same as that of Spurs - The FA Cup. We may yet meet in a re-run of the famous 1967 game in this year's final. Chelsea could be without number one goalkeeper Thibaut Courtois, who missed their FA Cup game and his country's friendlies. Both Courtois and defender Andreas Christensen face late tests and assessment. Spurs have announced their team news which confirms the absence of Harry Winks and offers a tease regarding Harry Kane. Kane continues his rehabilitation, as we play the guessing game as to WHEN in April he will be fit to play. In his press conference Mauricio Pochettino suggested Harry Kane MIGHT be available. Spurs will leave it to the last minute to make their decision. I personally would be surprised to see him start. Still, we have scored seven goals in his absence in less than two full games! Despite hardly featuring for England, Dele Alli was not mentioned in the team news, and we must assume he will be part of our usual front four with or without Kane. Dare I predict a win? Well, no I cannot go that far. Maybe I should check out football bets tips first. We have come close in recent times though, and this is as good a moment as any to end the hoodoo. I'd be more than happy with a draw, and I think that could be the outcome. I'm hoping for an Easter rising though! Match referee Andre Marriner has been in charge for three excellent wins by Spurs this season. They were the 2-0 away win against Newcastle, the 4-1 home win against Liverpool, and the January 2-0 win over Manchester United. On the downside, Mr Marriner was in charge of a previous defeat at Stamford Bridge, when a Frank Lampard shot which did not cross the line was allowed to stand as a goal (pre goal-line technology), and a late, late winner by Kalou was offside. 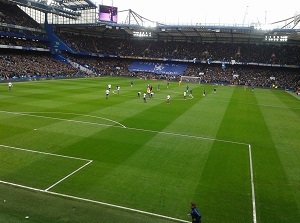 This was a match played in April 2011. � "It was Twenty Years ago today!" - On 28th March 1998, Spurs secured a vital away win against Crystal Palace.